The ultimate goal in abdominoplasty was not only to seek improvement in flaccidity but also an overall improvement in abdominal contour. The objective of this improvement was in the entire abdominal area including the lateral and lumbar regions. The combination of liposuction and abdominoplasty added the goal of achieving an appearance of abdominal muscle definition. 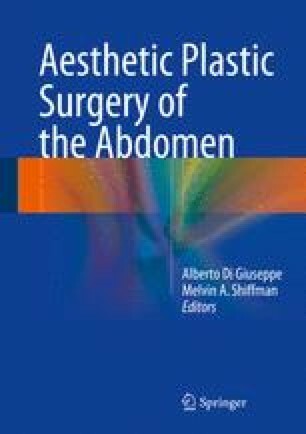 The author discusses surgical anatomy and the technique, postoperative management and results.,, marking the abdominal midline by progressive traction sutures and simulating the lateral portion of the rectus abdominalis muscles with liposuction and rectus muscle plication, has produced excellent results.